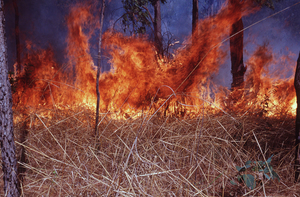 The intensity of a fire is all important in predicting its contribution to Greenhouse. A low intensity fire such as this one, will burn only the grassy fuels and the fine woody litter, and produce a little inert charcoal. A hot fire is more likely to kill trees and generate a large amount of charcoal. CSIRO research is refining the methods of inferring the intensity of fires that are visible to satellites during the day and night.